Our professional deputies and civilian staff conduct law enforcement operations, corrections operations, and special operations throughout Summit County, Utah. It is of great importance to serve every member of this community with professionalism and integrity. The Summit County Sheriff’s Office strives to have a close working relationship with all within this great mountain community. From myself and on behalf of the dedicated men and women of the Summit County Sheriff’s Office, we welcome you to our home on the Internet. It is a great honor and a privilege to serve the citizens of Summit County. I look forward to working closely with the public; together we can combat crime, identify the needs of the community and ensure the safety of all citizens. 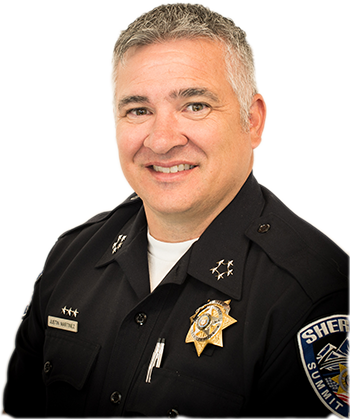 The Summit County Sheriff’s Office is committed to enforcing the law with integrity, fairness and courtesy, and I personally pledge to you that we will treat all citizens with impartiality and respect. As your Sheriff, I would like to solicit your comments about the agency and your suggestions for ways we can improve our services. Lastly, if you see something, say something… The Sheriff’s Office greatest asset is the citizens of Summit County, we need your assistance in helping to solve crime. I encourage residents to call us @ 435-615-3600 to report any suspicious incidents or activities.